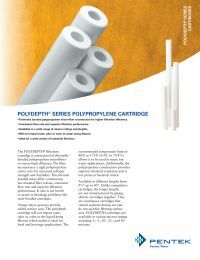 The POLYDEPTH® PD-1-30 filtration cartridge is constructed of thermally bonded polypropylene microfibers to ensure high efficiency. The filter incorporates a rigid polypropylene center core for increased collapse strength and durability. This thermal bonded micro-fiber construction has minimal fiber release, consistent flow rate and superior filtration performance. It also is not brittle or prone to breakage problems like resin-bonded cartridges. The polypropylene construction provides superior chemical resistance and is not prone to bacterial attack.